The beautiful cut and color of this dress make it a classic favorite that looks great on just about anyone! The Stylish Simplicity Dress is fully lined and made of chiffon. It has a sweetheart neckline with a crossover fabric detail at the bust. Adjustable spaghetti straps are included so you can decide if you want to wear this dress strapless or not. An empire waistband gives way to the flouncy skirt with a crossover detail in the front, giving a draped ruffle effect off to one side. A hidden side zipper completes this look. 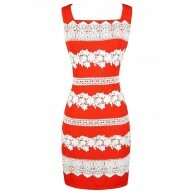 The Stylish Simplicity Dress would be perfect for almost any occasion. It works for dances, semi-formal events, or even as a bridesmaid dress. It would look nice paired with pumps, wedges, or strappy heels and some pretty jewelry. Details: Fully lined. Adjustable and removable spaghetti straps included. Hidden side zipper. 100% polyester. Dry clean. Do not bleach. Do not tumble dry. Do not iron. Small measurements: Length from top of bust to hemline: 30”. Bust: 32”. 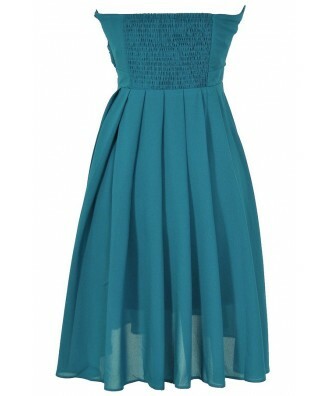 You have added Stylish Simplicity Dress in Teal into Wishlist. You have added Stylish Simplicity Dress in Teal for Stock Notification. You have set Stylish Simplicity Dress in Teal as a loved product. You have removed Stylish Simplicity Dress in Teal as a loved product.